Classic design men's luxury fashion wrist watch, with ultra-precise Japanese analog quartz movement and superbly stylish looks. It is quite suitable for a present with elegant package. Black genuine calfskin strap w/ crocodile-pattern embossing; sapphire crystal lens, stainless steel scratch-resistant case, water-resistant to 50m (165ft). Day and date calendar analog windows, seconds-minutes-hours chronograph/stopwatch. The 3 sub-dial are chronograph function. 30 day money back guarantee and full manufacturer warranty for up to 2 years, customer satisfaction is guaranteed. 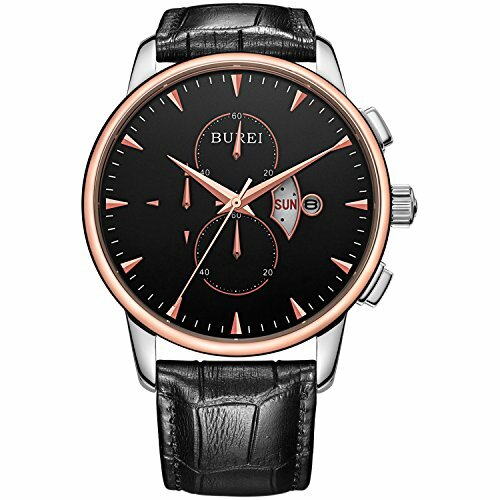 Case diameter 42mm, strap width 18mm, strap length 202mm; includes gift bag; additional colors and styles available from BUREI.